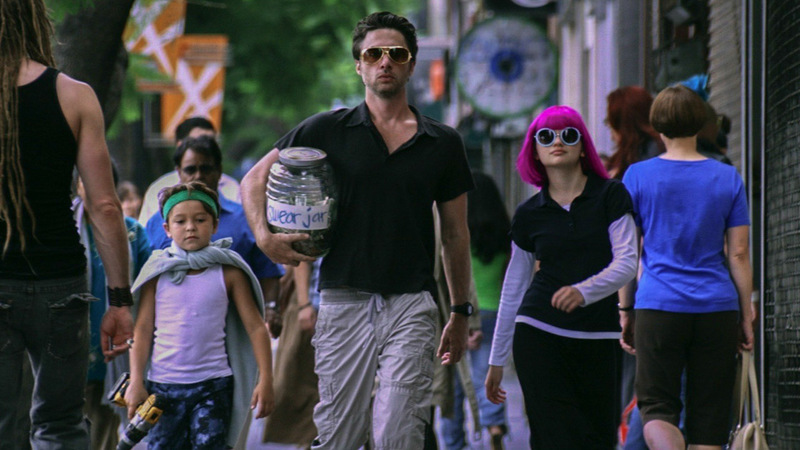 Last Thursday, I had the awesome privilege of seeing “Wish I Was Here” the infamous Kickstarter Zach Braff film that I have followed since its fruition. Many people have viewed Braff’s use of Kickstarter as smart while others have viewed it as overreaching. After seeing this film, I think what Braff did was smart because if he left “the final say” up to anyone else, I don’t believe that the movie would have been nearly as good or as beautiful as it was. “Wish I was Here” stars Zach Braff as an out of work actor struggling to fulfill his dream while sustaining his marriage wish Sarah, played by Kate Hudson, and being a decent father to Tucker, played by Pierce Gagnon and Grace, played by Joey King. Braff, as Aidan, struggles with his job, his life, and his father, played by Mandy Patinkin, who is equal parts awful and broken. “Wish I was Here” takes place at a point in Adien’s life when a change is necessary, he must rise to the occasion to help deal with his father’s illness while also coming to terms with his children growing up and that his dream of being a star actor may not be obtainable. Hudson, Braff, and Patinkin are excellent in this film and I truly believe Patinkin was the star of this film. His facial expressions and his phrasing made me believe that he truly was the struggling grandfather while Hudson displays sides of her acting strength that I haven’t witnessed in quite some time. Braff is an excellent director/actor/producer within this film. You can feel how much he wanted to make it and how much he loved it, from the perfect song choices to camera angles, to the poem that is read throughout. This movie is tear-jerking and beautiful and I will own it once it comes out on DVD. See this movie in theaters, support this great film, and go an witness something special for 2 hours.